Today I have some fantastic products to show you from cult (and budget friendly!) British brands Barry M and Beauty UK which are now more widely available outside of the UK, so US and Aussie readers stay tuned as I will tell you exactly where you can buy these now! 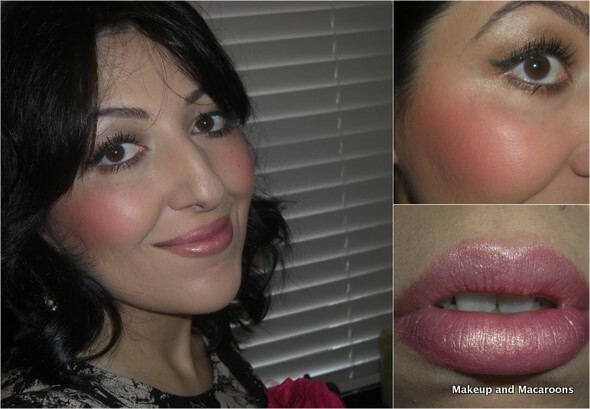 This is a gorgeous warm rose/pink shade which is finely milled so is very easy to blend on the cheeks. You only need a light touch to get a beautiful rosy flush with this matte blush. I wore it to work this morning and 12 hours later it still looks fresh on my cheeks. 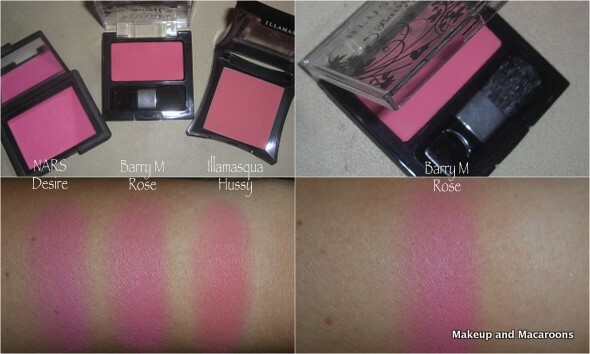 Here's how it compares to Illamasqua Hussy and to NARS Desire to put it in perspective. It's not as blue based as Desire, but also not as warm as Hussy. It's somewhere in between. This is unlike any colour that I already own. I'm sure you've figured out by now that I gravitate towards bright opaque corals and pinks. But after trying on this colour for the first time I L.O.V.E. it. Seriously! It is such an easy to wear colour, and unlike my other Barry M lipstick (Peachy Pink...reviewed HERE), it's not drying at all. The formula feels really creamy on, and while it's not long lasting, it is a delight to apply as it just glides on the lips. This is the first time I'm trying anything from Beauty UK and I must say I'm extremely impressed with the pigmentation. It reminds me of the pigmentation of the Sleek palettes, minus the fallout. 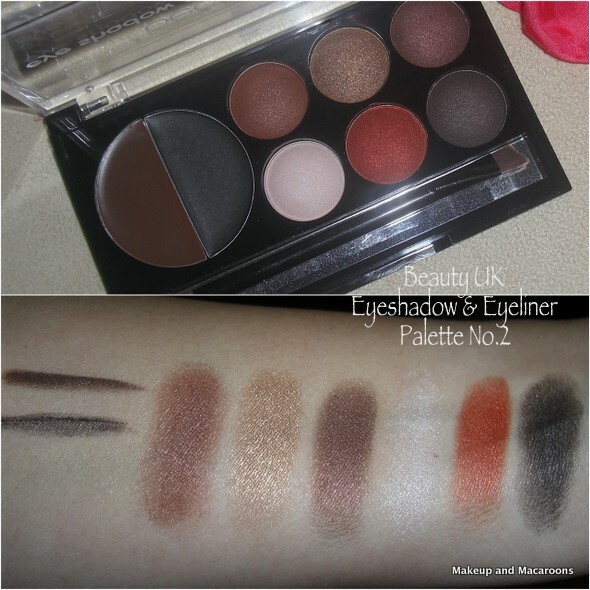 I probably wouldn't use the two cream eyeliners included in this palette as they don't seem dark enough for me, nor the reddish eyeshadow, but the rest of the shadows are very wearable. And at less than $10AUD it's great value. I used all three products today and here's how the look turned out.... I did mention I love the lipstick, right? US readers, if you've been lemming after Barry M makeup but found it hard to it track down in your country, My Makeup Crush (the US arm of my favourite online cosmetics store) are the exclusive stockists of the brand in the US. It's a new site, so they're still adding new brands to their portfolio but in the future expect to see more British and Australian brands sold there. The site needs to be bookmarked for sure! Aussie readers, I'm sure you've heard me talk about Crush Cosmetics before as that's where I buy my Sleek, Barry M, Milani and Wet n Wild from. Well now for the first time they have started stocking Beauty UK products! Yeay! As you can see from my swatches above the brand seems of great quality and cheaper than a bagel sandwich at The Great Bagel & Coffee Co. (yes, I am still obsessed with bagels!). Have you tried anything from either of these brands before? Any favourites? Disclaimer: Products provided for review. I'm not affiliated with the brands, Crush Cosmetics or My Makeup Crush. I'm not paid to write this. It sure is, it's so versatile! ASOS stock some of the Barry M product range as well - have you bought any through them? I haven't bought anything from ASOS, but I do want to try getting Illamasqua from them as they're cheaper than at the shops. nice haul ! like the lip color , quite different ..
That lipstick looks amazing on you - of course!! Thanks Vita, it's not my usual colour but I love it. I'd seen that Beauty UK was now being sold on Crush but just had not heard of the brand, I'm keen to find out more about it now! Definitely check them out Megan, they're so cheap and based on other online swatches their lippies are great too. plus, I love that lipstick on you! Thanks hun, and yes it's great that you can buy the brand (plus more later) in the US finally! Sweet Angel Lilit! Bringing me news from a beautiful place! 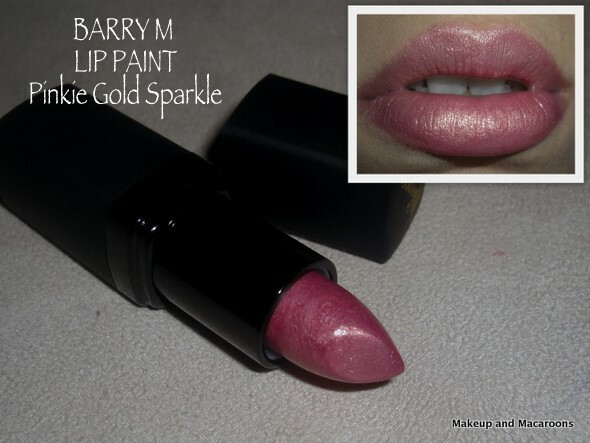 You can totally bet that I am going to start picking up some Barry M lipsticks! I absolutely love the blush! I'm a sucker for anything pink lol. I'll def check out mybeautycrush. Thanks so much for sharing!